The yard long beans from our garden have been bountiful, and I wanted to try a new recipe using them. 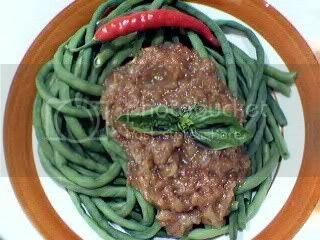 Sometime ago I saw a recipe for long beans pecel and I had been wanting to try it. This was my chance. Pecel is an Indonesian peanut butter based sauce usually served over boiled vegetables. One of the cookbooks I bought called New Asian Cooking (published by Bay Books) has an Indonesian recipe called Gado Gado, and it has a peanut sauce recipe on it too, but I found another version here that I thought might be a tad better, and has the ingredients that I have on hand. I changed the proportions some, and made a couple of additions. I think my version was not so bad. My husband loved it, and we almost ate the whole thing! About a pound of Yard Long Beans – I decided to leave the beans long, as I thought it looked prettier this way than cut up. If the kids had been home, I may have cut it up to more manageable size. Juice of 1/2 lime or about 1 tablespoon. Blanch the beans for about 5 minutes or until tender, and drain. 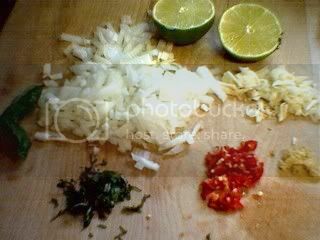 In a pan, heat 1 tablespoon of oil and saute garlic, ginger and onions until fragrant and tender. Add the cayenne pepper, oyster sauce, fish sauce, coconut milk, peanut butter, brown sugar and heat through. Add the basil leaves and remove from the heat. Pour the sauce over the beans and enjoy! sarap magpicnic sa garden mo JMom…with resident bunnies to boot! my kids would love to have them in our backyard, never mind our puny little veggies heehee…. i just tagged you for the cookbook meme …sige na JMom! a peek into your cookbook collection please. before the girls come back! mwa mwa! This is a wonderful idea! We also have sitao in the backyard, sometimes more than we can handle, hehehe! Thanks for the recipe! Hi Ara! Eto ang recreation namin ni mister ko, just puttering around the garden. I’ve been teasing him that everytime I come home, he has dug up a new part of the yard. It’s good exercise too, he’s getting his old abs back ;-)Plus it’s so rewarding to be able to eat from your own garden. I haven’t bought veggies in a month! Hi Toni! Yes, so simple and delicious, especially when the veggies are fresh, you don’t really have to add much to make them taste good. It was such a departure from my usual stir fries and stews, it was a good change. I was glad I found this recipe. Now Hubby wants to try that sauce on chicken. Sarap talaga eh! Wow! Fresh veggies! And that’s a great recipe. Simple lang! Buti ka pa may garden ka ng veg. ako di ako pwedeng magtanim but I do like having herbs sa garden,kahit sa paso man lang.